So you've now connected to wireless device to your WiFi Connect, but now you need a connection to the internet. If you have the WiFi Connect with 3G/LTE, here's how you can take advantage of that and have internet on the road! 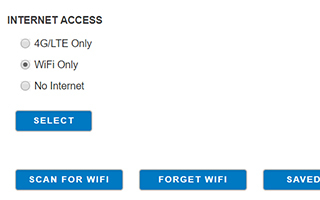 Step 2: Near the bottom of the main page under the heading "Internet Access", select 4G/LTE Only and click Select. Note: Make sure you have data in your Winegard account first. 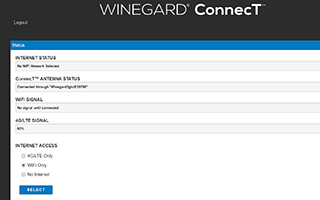 Winegard provides 300mb of data as a trial with your Winegard Connect. 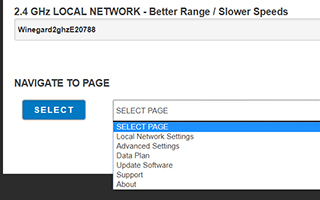 Step 3: To add data to the 4G1 from the status screen, select "Data Plan" from the dropdown menu at the bottom of the page and click Select. 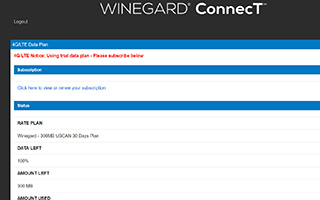 Step 4: Once on the Data Plan screen, you can see how much data you have remaining, or click the link to shop.winegard.com and follow the steps shown to set up and add data to your account. Note: Connecting to the Internet through 4G/LTE will use data from your Winegard Connect Data Plan. In order to get to shop.winegard.com, you must be connected to an Internet source.